Thatching is the process of creating a roof surface using plant material. Phragmites reed grass, a traditional thatching plant originally from Europe, is the material that we are using at Natural Cottage Project workshops and at the Strawbale Studio. Roofs made with reed thatch are long-lasting, insulative and very beautiful. 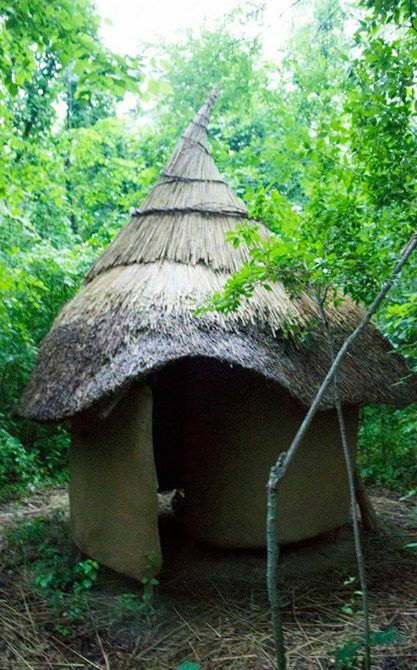 Reed harvested in local fields and marshes are applied in layers, and held in place with sways (long wooden sticks harvested from the woods) which are literally sewn to the roof structure to secure the reed to the roof. The layers are applied in an overlapping fashion and tamped up to create a finely shingled effect. Rain transfers from reed to reed on the outer layer, and does not penetrate down into the roof. A ridge application, of reed or other natural materials, protects the top of the roof. In the design of the roof it is important to have at least a 45 degree angle (12/12 pitch) so that the water flows quickly down the surface and off the roof. It is a slowly biodegrading roof expected to last 25 or more years, and re-thatching on top of the existing layer can continue to extend the life of the roof. Ridge applications need to be redone, or over-coated more frequently from 5 – 15 years depending on the plant material used, or a more enduring copper cap can be constructed. Thatched roofs are traditionally put on hip roofs and gable roofs. Although this is an artful craft and a skill that can take many years to master, the basics can be understood and learned by beginners, and a successful and beautiful roof created. After learning the basics in a course, it would be recommended to start on a small structure to practice the process of harvesting, storing and application. Thatching Outline Details, ordering materials. Rain dripping off the Thatched Roof of the Strawbale Studio ~ 1 min. Youtube video by Dana Driscoll. Natural Building Materials & Strategies, including extensive information on Thatching. Folks involved in Thatching in U.S. ~ Master Thatchers: William Cahill, Collin McGhee. Lay-thatchers: The Brotherhood of Christ, Eric Puri & Michael Beck from thepoosh.org. 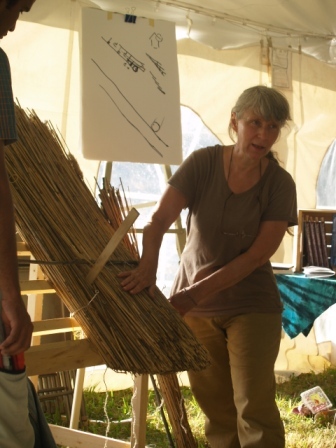 (reed harvesting video) Deanne Bednar of Strawbale Studio. Using Phragmite Reed Grass as a biofuel: Latvia. Great Lakes. Making Paper from invasive plants.